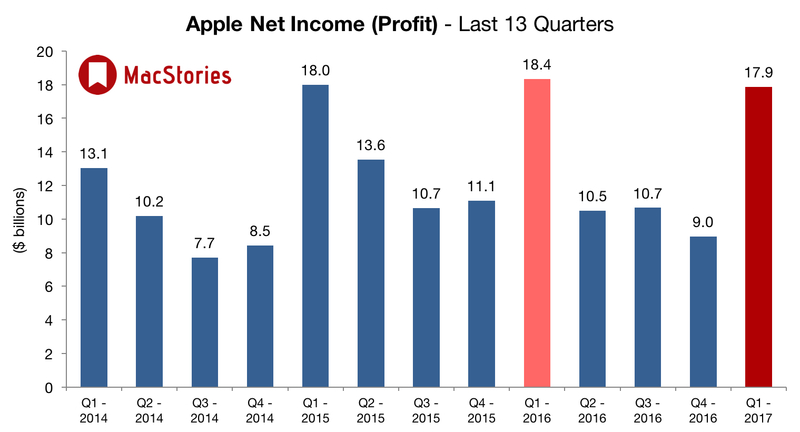 Apple has just published their financial results for Q1 2017, which covered the period from September 25, 2016 through to December 31, 2016. The company posted revenue of $78.4 billion. 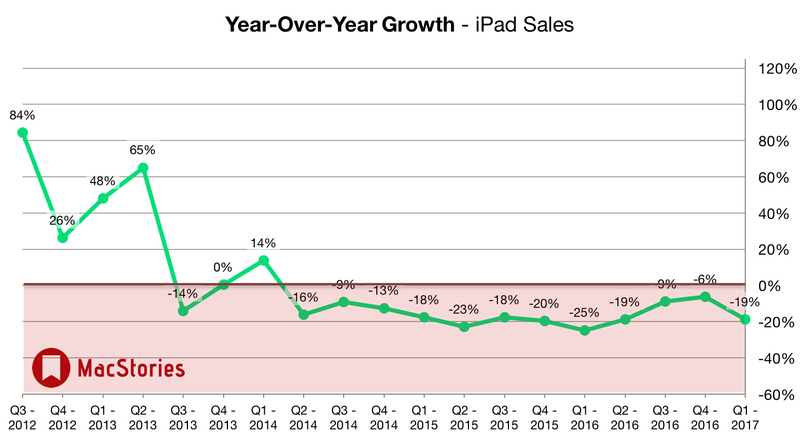 Apple sold 13.1 million iPads, 78.3 million iPhones, and 5.4 million Macs during the quarter. 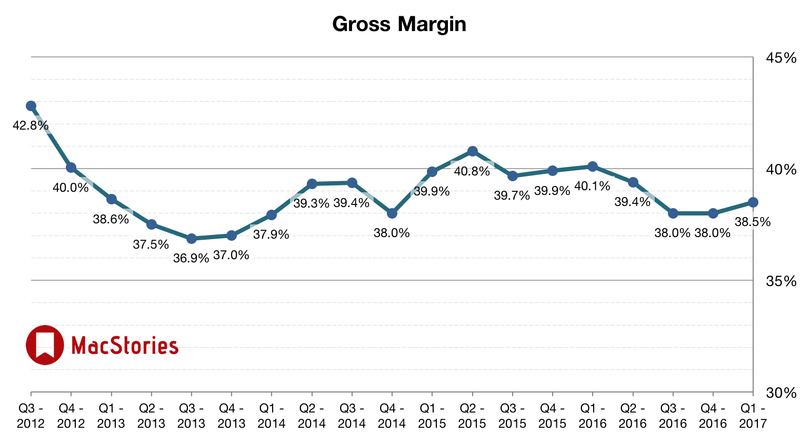 Apple's revenue guidance for Q1 2017 fell between $76 billion and $78 billion, with gross margin estimated to be between 38% and 38.5%. 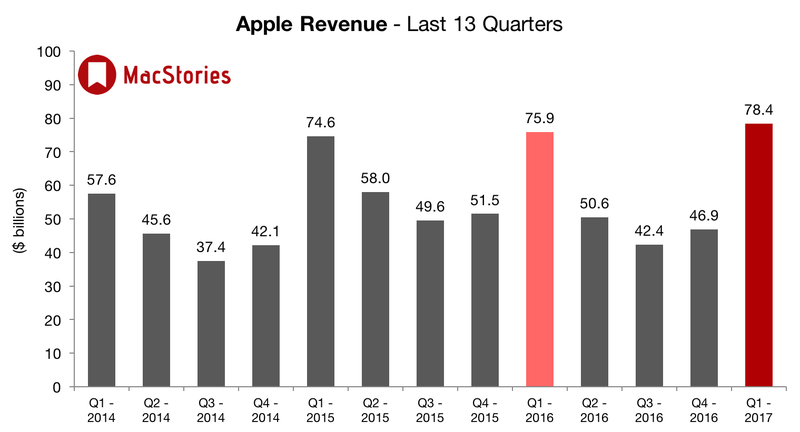 Current Street consensus is for the company to reports earnings of $3.22 per share on revenues of $77.4 billion (Apple had guided to revenues of between $77 and $78 billion) for the December quarter. The Street is also expecting that the company will have sold 78 million iPhones in the holiday quarter, compared to the 75 million units sold in the same quarter in 2015. Wall Street is expecting average selling prices (ASPs) to drop to $687 per phone from $735 per phone in the prior year. 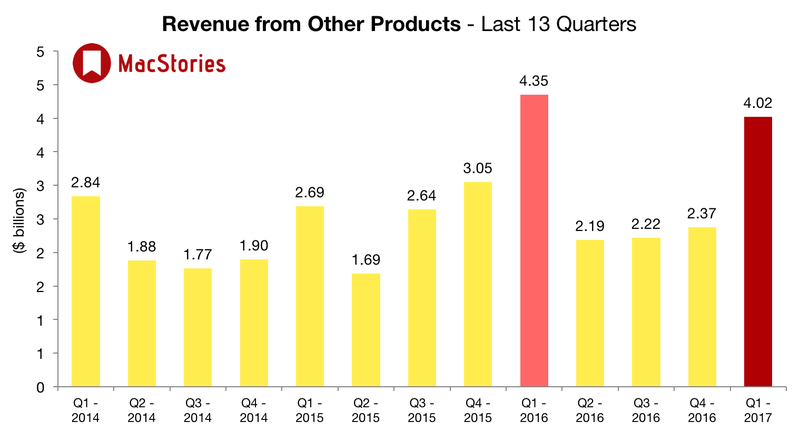 In the year ago quarter (Q1 2016), Apple earned $75.9 billion in revenue, and $18.4 billion in profit. 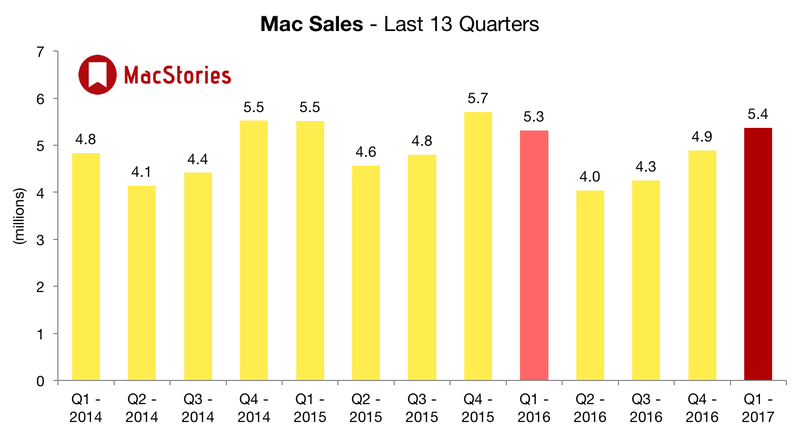 During that quarter Apple sold 74.8 million iPhones, 16.1 million iPads and 5.3 million Macs. 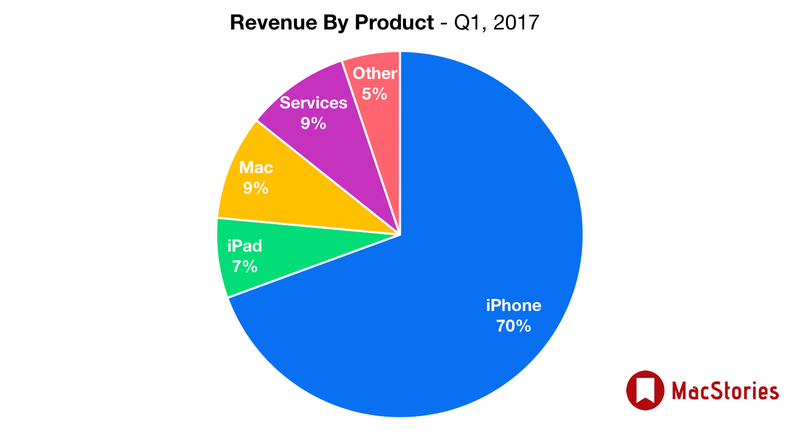 Apple reported all-time revenue records for iPhone and Apple Watch, Macs, and earnings-per-share. 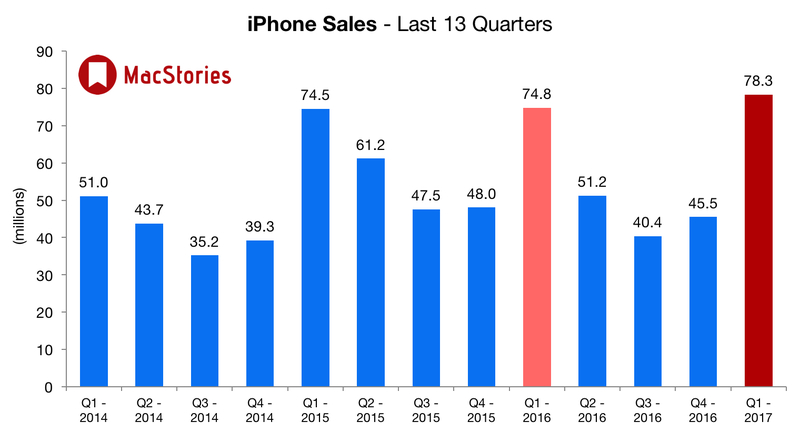 Apple saw "especially strong demand" for the iPhone 7 Plus. Demand for the 7 Plus exceeded supply during the quarter. 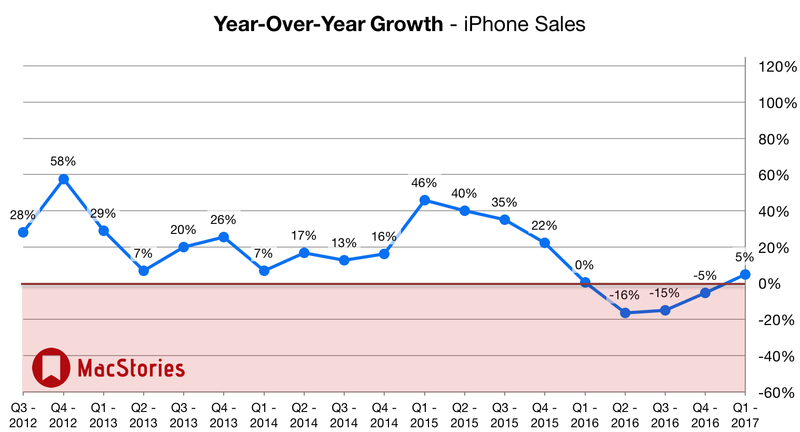 Thanks to this, iPhone ASP went up to $695 from $619 in the September quarter. 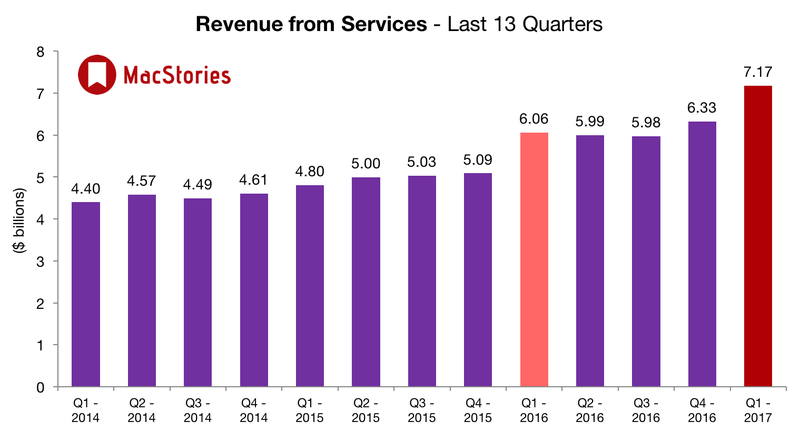 Tim Cook: "It was our best quarter ever for Services." Apple has over 150 million customers paying a recurring subscription for their services (which include iCloud and Apple Music). There are now 2.2 million apps on the App Store. The developer community earned over $20 billion in the 2016 fiscal year. Apple Pay users have tripled over the past year. 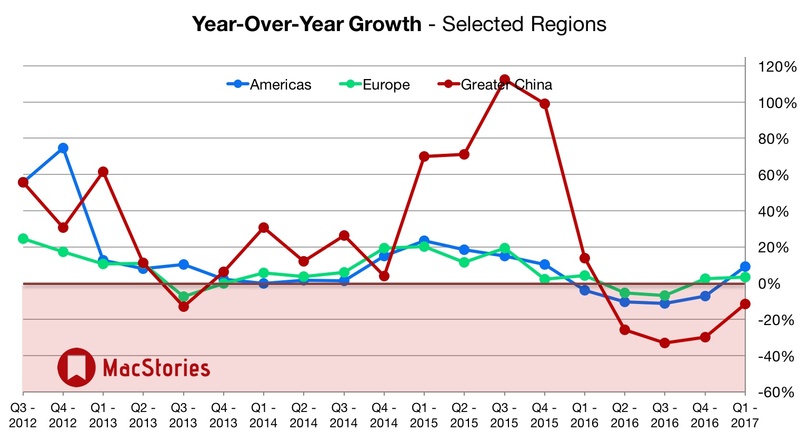 Apple expects their Services business to be the size of a Fortune 100 company this year. Apple wants to double the size of their Services business in the next four years. 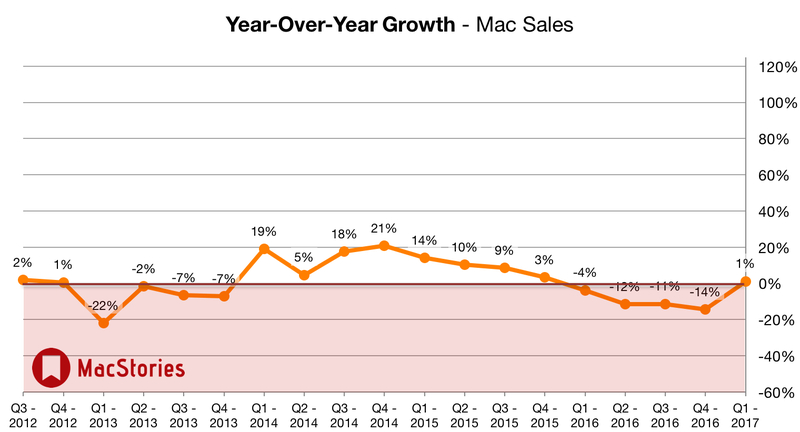 Most customers are now buying their first Mac, primarily coming from Windows PC. Tim Cook personally uses several HomeKit automation devices in his home. Apple's year-ago revenue included benefit of one-of $540 million patent infringement payment. 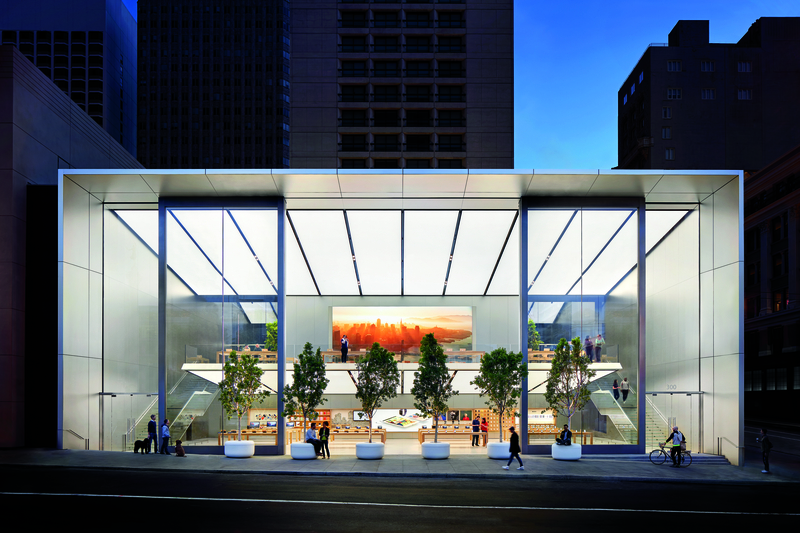 Apple's retail stores experienced double-digit growth in sales and visitors. Over 1 million people are using CarPlay. 13.1 units sold is higher than Apple's expectations. 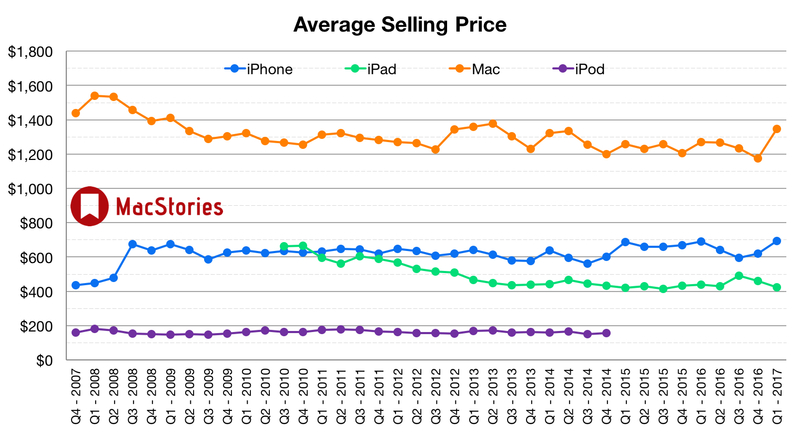 iPad has an 85% market share for tablets above $200 in the US. 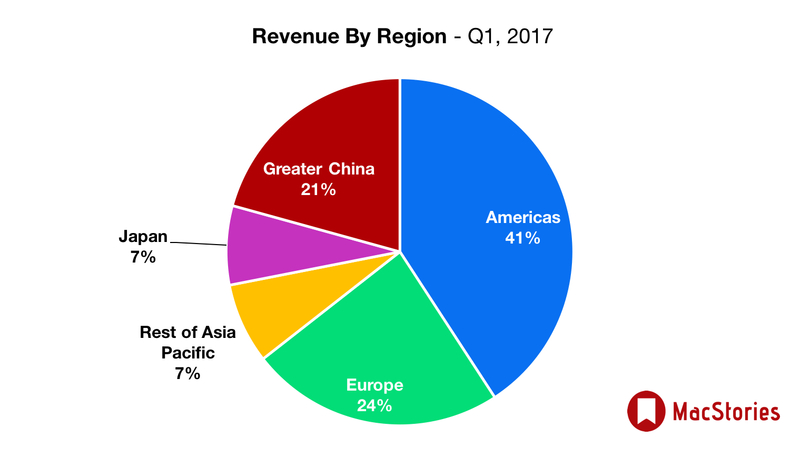 According to CFO Luca Maestri, there are a number of areas where Apple's App Store business could do better, such as growing the developer community in emerging markets. The iCloud storage business is "growing very quickly", according to Maestri. 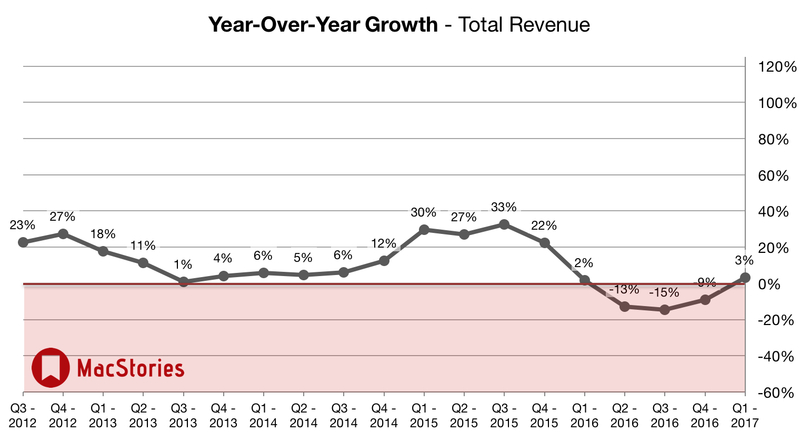 Apple revenue guidance: $51.5B to $53.5B. Just a tad light but should be OK.
Tim Cook says Plus was highest portion of mix than in the past. Just like I have been saying from data we see. Cook: Apple Watch unit sales record. Implies more than 4.7M units. Luca: Within Services, there are a number of categories. App Store is driving significant growth right now, 43% 13 weeks over 13 weeks. 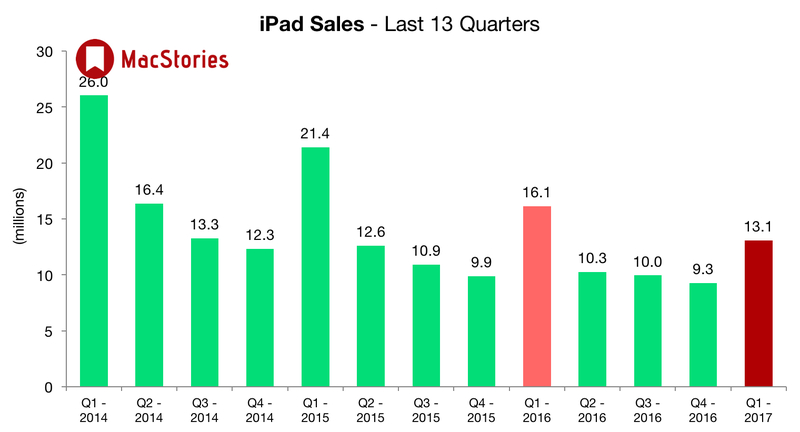 Below, we've compiled a graphical visualization of Apple's Q1 2017 financial results.